Smelting gold usually involves high-tech and high-cost tools to perform. Mostly, mining companies do the procedure, which sees one material bonded to or released from another in the presence of extreme heat. 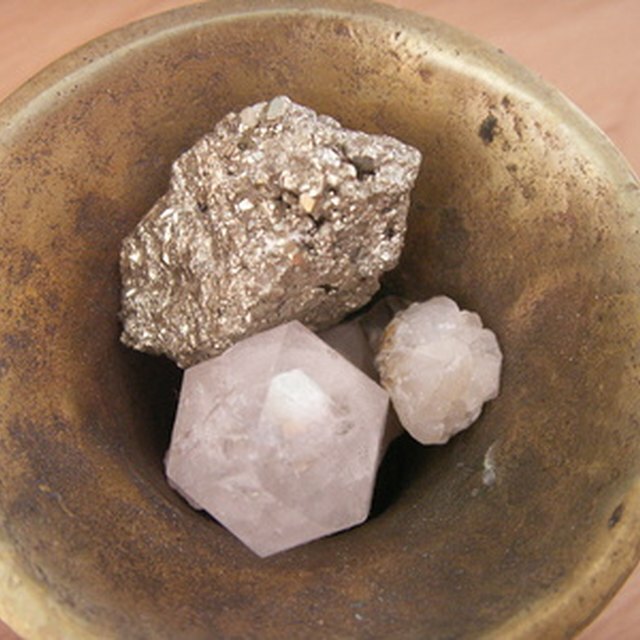 However, prospectors, and people at home, can smelt their old gold using some simple steps. All it requires is access to a few common minerals and compounds, and a high heat source. Once you have your can, cut a small hole in the side to allow in a metal pipe. Install a mesh grate halfway up the can — solder this in place or hold it up with metal legs; your charcoal will rest on this. Dig out a hole in the ground twice as big as the can. Place the can in the middle and surround it with firebrick and clay. Connect a hair dryer to the open end of your metal pipe — use duct tape if necessary to close up any gaps. Once you complete your furnace, you can go about collecting your purification materials. You can remove the most common metals found in gold ore (copper, zinc and lead) using elements that bond with oxygen at lower temperatures than gold. This oxidation process will make copper oxide, zinc oxide and lead oxide — all of which are less dense than pure gold and will float to the top of your crucible allowing the slag to be sloughed off. Sodium nitrate, silica, and sulphuric acid cause this reaction. All of these are easily attainable at a hardware store, or you could use household items such as borax and broken beer bottles to replace the first two. You will need to contact a chemical supplier to obtain the acid. Load the solid gold ore into your crucible then load the furnace with charcoal. Light the charcoal and let it ash over. Set the crucible directly on the charcoal. Load more charcoal around the crucible. Turn the hair dryer on low to force air into the chamber below the charcoal. If the temperature fails to get high enough to melt your ore, turn the hair dryer up to high. Be very careful not to get the charcoal so hot that it causes the ore to liquefy and then bubble. Extremely high temperatures can cause the crucible to crack or even explode. Once the liquid starts to swirl in the crucible, add the oxidizing agents. This will cause the lead, copper, or zinc in the mixture to come to the top. Pour off the slag into a heat resistant container. The liquid will be too thick to pour once it is cold. Add in some borax to thin out the liquid. When the liquid cools, chip off the glass — which will have floated to the top during the cooling process — and there is your gold, smelted to perfection. When you pour the liquid gold out of the crucible you probably don't want it to end up in some misshapen glob on the ground so you need to have a casting dish. Any cast iron vessel will do, or you could create your own special design using a delft casting method. This method incorporates simple clay sand casting with precision design including pouring channels. The compact nature of the sand doesn't allow the liquid gold to push its way down and thus it pools and cools in the cast. Rockwell, William. "A Poor Man's Method of Smelting Gold." Sciencing, https://sciencing.com/poor-mans-method-smelting-gold-8649681.html. 22 May 2018.